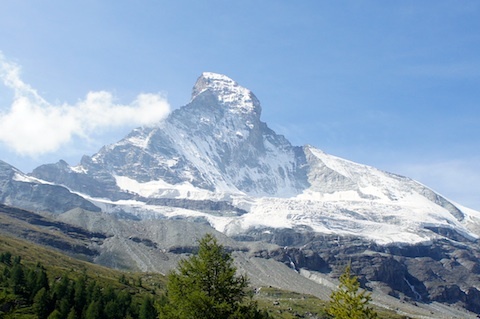 Last August, I went to Zermatt to hike in the Swiss Alps and to escape the heat in Paris. It was on this same trip that I stayed in Chamonix and hiked in the French Alps (see the Travel Guide to Chamonix if you are interested in visiting the French Alps). 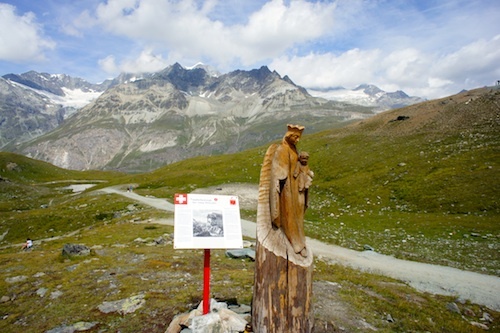 Driving from Chamonix to Zermatt is easy and takes only 2.5 hours. You can’t drive to the center of Zermatt itself because cars are not allowed to enter the town (there are exceptions for delivery vans, construction trucks, agricultural vehicles, electro-mobiles belonging to hotels and other businesses). You have to park in one of the many car parks in Täsch, a village below Zermatt, and take the train from the Matterhorn Terminal Täsch to the center of Zermatt, a trip that takes approximately 10 minutes. If your hotel does not arrange to have an electro-mobile pick you up, you can always hail a cab in front of the station. You have to decide if you want to stay in the centre where most restaurants, bars and cafes are located. From there you can take a cable car to any of the main lift stations and start hiking. I opted to stay at the Hotel Matthiol, 20 minutes away (on foot) from the centre. There it is more tranquil and beautiful because one is surrounded by trees and has better views of the Matterhorn and the mountain range. I walked to and from the centre. It’s not difficult but in bad weather, it can be unpleasant. (1) Hotel Matthiol (recommended): Boutique hotel 20 minutes from the centre at a higher elevation, quiet, private, contemporary design, free Wi-Fi, large rooms and bathrooms, outdoor terrace, excellent breakfast, restaurant and bar (in the evenings), terrific spa with Finnish sauna, steam room; excellent service (staff gave very useful advice on where to hike, where to eat in town). (2) Riffelalp Resort: Luxury hotel for those who want absolute peace and serenity. 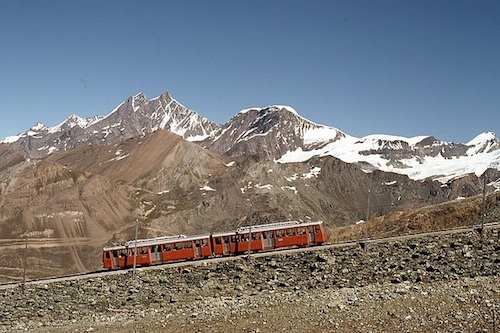 It lies 2222 metres above sea level and to get there, you have to take the Gornergrat train from the centre. There’s nothing around it except mountains and you have the most stunning views of the Matterhorn from your room, the pool, the outdoor terrace and restaurant. (3) Hotel Matterhorn Focus: Hotel very close to the centre of Zermatt and next to the Klein Matterhorn cable car so you ski in and out with no delay. Contemporary design, floor-to-ceiling windows, spa, free Wi-Fi. (4) The Omnia: Luxury hotel overlooking the centre of Zermatt (you get to the lobby via a lift that ascends 1600 metres from the valley); contemporary design, individually decorated large rooms and suites, excellent restaurant, spa, indoor and outdoor pools, outstanding restaurant that even has a vegetarian menu. If, like me, you begin your hiking (or ski) holiday in Chamonix, you will notice immediately the difference between the food in France and the food in Switzerland. The food in Chamonix is just better — more refined, greater variety of dishes, more vegetarian and fish options. I can eat a heavy meat or cheese dish once in a while, but not for days on end. So if you can’t stand to see another plate of raclette or grilled meat, dine at one of the restaurants located in the luxury hotels (see the list above). My favorite restaurant in Zermatt happens to be Da Giuseppe, an Italian restaurant that serves excellent southern Italian cuisine (I believe the owner hails from southern Italy). You won’t find pizza there. The prices are very reasonable and they give you a complementary aperitif. The cozy little place is bursting with the energy of Giuseppe himself and the joyful banter of gregarious diners who are thrilled they’re not eating meat and cheese yet again. Da Giuseppe is located on Vispastrasse 26 (phone number is 0279671380 — reservations recommended). Restaurant Julen at the Hotel Julen serves meat, fish and vegetable dishes cooked in a more sophisticated fashion than one normally finds in Zermatt. The hotel restaurant is located at Riedstrasse 2. If you must try Swiss mountain food, check out Schäferstube, a small cozy restaurant (in the cellar of the Hotel Julen) that serves raclette, fondue, lamb stews, grilled meats, potatoes. – From Zermatt take the train up to Sunnegga, walk to Leisee, then proceed to Grindjisee, Grünsee, end up in Riffelalp for lunch (the outdoor terrace of the Ristorante Al Bosco at the Riffelalp Resort is perfect), take the Gornergrat bahn down to Zermatt. After a long hike and a lovely lunch at Ristorante Al Bosco, I caught the charming Gornergrat train from the little station by the Riffelalp Resort to return to Zermatt. I was looking forward to taking a hot shower and a short nap in the afternoon. A few minutes later, the train entered a short tunnel and stopped. The passengers waited and still nothing happened. The lights went out for a few minutes, then came on again. More waiting. After 20 minutes, the train slowly moved until it was just outside the tunnel. Then it stopped again. I am not used to Swiss trains breaking down for no reason. Suddenly the doors flew open and several of us stepped outside. Three men, all hikers, approached the conductor’s window and although I could not hear what was being said, it was evident that the hikers were asking the conductor for the location of the nearest trail down to the valley. At no time were we informed about why the train had stopped and when it was going to resume its downward journey. I couldn’t sit there and wait for who knows how long. So I followed the hikers down. About fifteen others did the same. Unfortunately, many of the passengers on the train who might have liked to join us, were not equipped to walk down the mountainside. Many were wearing inappropriate footwear (high heels, open toe sandals); across the aisle from me was an Asian couple with a silly lap dog. Down I went after the other hikers. It was a steep but not treacherous descent which took about an hour through the woods, on paths covered with dry pine needles. I could feel the strain on my knees but I continued to head down until finally I came upon the meadow right next to the Matthiol hotel. At least I did not have to go all the way down to Zermatt like the others. I don’t believe the Gornergrat train breaks down often, however, you have been warned. Wear good shoes and be prepared to walk down.